Anchor Fundraising knows that the foundation of every successful fundraiser is a proven product that tastes great and is unique to the fundraising market. That's why we've chosen to feature the Pastry Puffins and PuffCrust Pizza Puffins. Your fundraiser should taste this good! 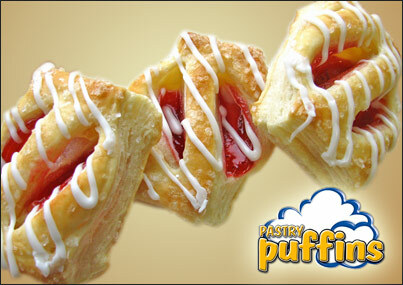 Flaky puff pastry and scrumptious fillings combine to make one of the most delicious pastries you'll ever eat. Hundreds of thin layers of puff pastry dough filled with sweet flavors combine to make an irrestible pastry treat. The Pastry Puffins® product is freezer-to-oven easy to prepare with 12 individually portioned pastries, meaning that you don't have to plan ahead to have a great tasting treat. Break off only the number of Pastry Puffins you wish to bake up, and leave the rest in the freezer -- no thawing or raising is required. In fewer than 30 minutes a great tasting treat will be ready. Click here for Baking Instructions. Flavors include: Apple, Blueberry Cream, Caramel, Cherry, Cinnamon, Cream Cheese, and Strawberry Cream. Check out our fundraising program in more detail with our Pastry Puffins Fundraising Flyer. Also, Anchor Fundraising offers great incentives for motivated sellers. Contact us for info on our Fundraising Incentive Program. PuffCrust Pizza Puffins is a one-of-a-kind pizza experience. 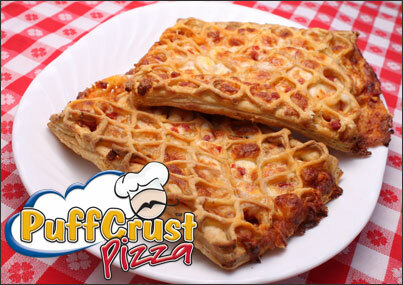 The Puff Pastry crust and unique lattice top is infused with mozzarella cheese and pizza seasoning. Delicious meats and cheeses are inside making this a Pizza-Lover’s delight. The PuffCrust Pizza Puffins are freezer-to-oven easy. Place one or both PuffCrust Pizza Puffins in the oven and in fewer than 30 minutes you'll have a wonderful pizza snack. Complete Baking Instructions are here. Flavors include Cheese, Pepperoni, and Sausage.